Remodeling your kitchen can be a wonderful experience. After all, this is probably one of the most used areas of the home, which means that appliances take a lot of abuse over the years. That being said, the sink is not only one of the focal points of the kitchen, but it is where you wash all your dishes. With all that water and heavy foot traffic going through the sink area on a daily basis, you are going to want to invest in a sink that can provide quality and looks at the same time. And that is exactly what the Hahn Handmade ZR002 can do. This 32-inch sink not only provides ample space for your washing needs, but it is going to give you a kitchen with a traditional and modern feel that you desire. Stainless steel is without a doubt one of the most durable types of metal on the planet. It can hold up under a variety of strenuous situations and it looks amazing while doing it. This is why the Hahn Company decided to construct the Hahn Handmade ZR002 out of 16-gauge type 304 which offers even more durability and beauty. Whether you accidentally drop a bowl or a pan in this sink, you can rest assured that it is going to keep on looking good and standing strong. One of the best things about the Hahn Handmade ZR002 is that it is a single bowl extra large sink. This means that there is no partition in the middle. This is important because it offers more washing room. You can easily wash big pots and pans without making a mess that you often times do in smaller sinks. Whether you are washing an abundance of dishes or you have a large baking pan that needs to be washed, you won’t have a problem accomplishing the task with ease when you invest in the Hahn Handmade ZR002. Whether you are investing your money in a sink or a car, you probably want to know that you are getting quality. Well, you can put your mind at ease when you invest in this sink, because it comes with a limited lifetime warranty. This means that if you ever experience any problems with the craftsmanship or design of the sink, the manufacturers will rectify the situation for free. If it comes down to it the company will even replace the sink free of charge, if need be. The Hahn Handmade ZR002 is an undermount sink that measures 32 x 19 x 10 inches. 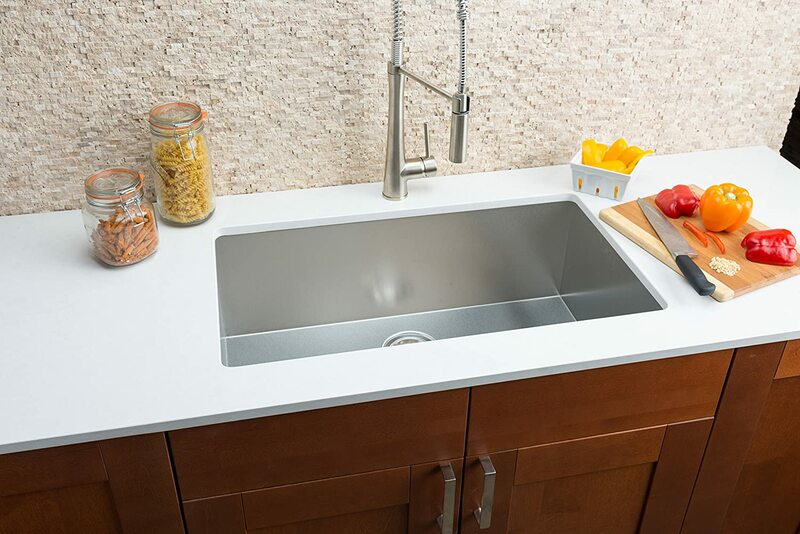 This sink might seem a little small for some modern kitchens, but the extra room and depth of the sink will provide you with all the cleaning room that you need to keep your dishes clean. The best part about the depth of the sink is that you can leave dishes in the sink and no one will ever see them unless they are standing directly over the top of the sink. No one likes a dirty kitchen, but sometimes you get distracted or just don’t have the time to fully clean the dishes. The sink does weigh right around 51.8 pounds, which might seem a bit heavy, but it is a fair amount of weight for a sink of this durability. 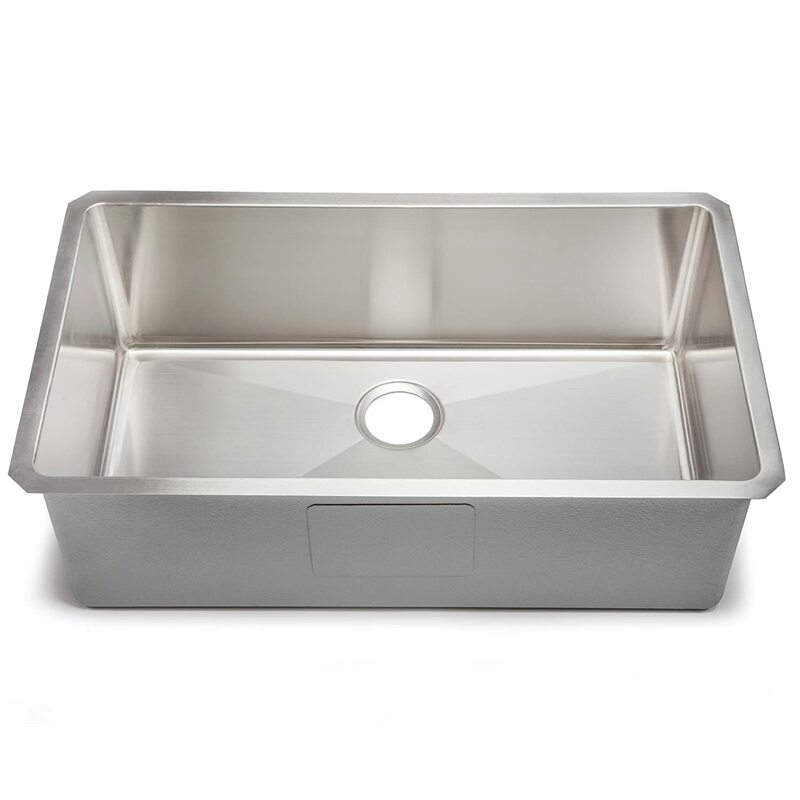 If you have ever used a deep stainless steel sink before you probably already know that they can be quite loud when water is splashing down onto the bare surface of the sink. It will sound something similar to rain pouring down outside. And, that is why the Hahn Handmade ZR002 is specifically coated with a sound-deadening agent. This coating not only makes the sink quiet but it prevents condensation as well. Stainless steel is a cold metal and when you apply heat to it, it could potentially condensate. This is somewhat similar to a cold Cola can sitting outside on a hot summer day. This could do a tremendous amount of damage to the counter and cabinets that the sink is housed in because they will be made out of wood. Wood warps and bows when it is exposed to a large amount of water over time. Fortunately, this is one worry that you can put out of your mind thanks to the sound reduction coating. The coating mentioned above not only reduces the sound of water crashing down in the sink, but it prevents condensation as well. When you invest in the Hahn Handmade ZR002 you aren’t just getting the sink alone. You are actually getting the sink, the basket strainer, and a sink grate which is a durable stainless steel grid that will set in the bottom of the sink. The custom design from the manufacturer will fit perfectly in the sink and leave the strainer exposed, so you can easily drain water when needed. This grate is an important part of preserving the beauty and durability of your sink. It protects the bottom surface of the sink from utensils and dishes. It also allows you to set other dishes to the side and dry while you are cleaning others. The strainer basket is just equally important. Most sinks don’t come with the strainer included, which can be a major problem. It is not like these parts are expensive, but there is always a chance that you could get the wrong sized one, which will cost you another trip to the hardware store. Luckily, that won’t be a problem with the Hahn Handmade ZR002 because the sink comes along with the right sized strainer. Installing a sink might seem like an easy process, but it really isn’t. This is especially true if you have to make additional cuts. Maybe you need to widen the opening so that your new sink fits. Well, just the slightest miss cut or measurement and you are looking at replacing the entire countertop. Fortunately, when you invest in the Hahn Handmade ZR002, you get a handy little template. This template is perfectly designed to represent the dimensions of the sink, so all you have to do is put it on the countertop and trace it out. This makes it virtually impossible to mess up on your measurement. It is always advised to choose an expert for the installation purposes since it is an undermount bowl and such kind of bowls demand your countertop to be as per the appropriate standards. Clean your sink daily so as to maintain the surface’s integrity and look. A soft abrasive cleaner can be used for this purpose. The cabinet of your sink base is required to be 38″ or wider. Hence, you should ensure that it is large enough to support the dimensions. The Hahn Handmade Undermount Single Bowl Sink would honestly turn out to be the best part of your revamped kitchen. It makes cleaning as easy as pie and all your cleaning tasks are over in a breeze since draining and washing of the dishes is now possible in a single swoop. This sink is designed to last and its enchanting design makes it a perfect addition to your kitchen. The model features a quirky finish and elegant lines to up your kitchen game and is crafted with the help of best-in-class materials, supreme grading and a careful attention to each and every detail. 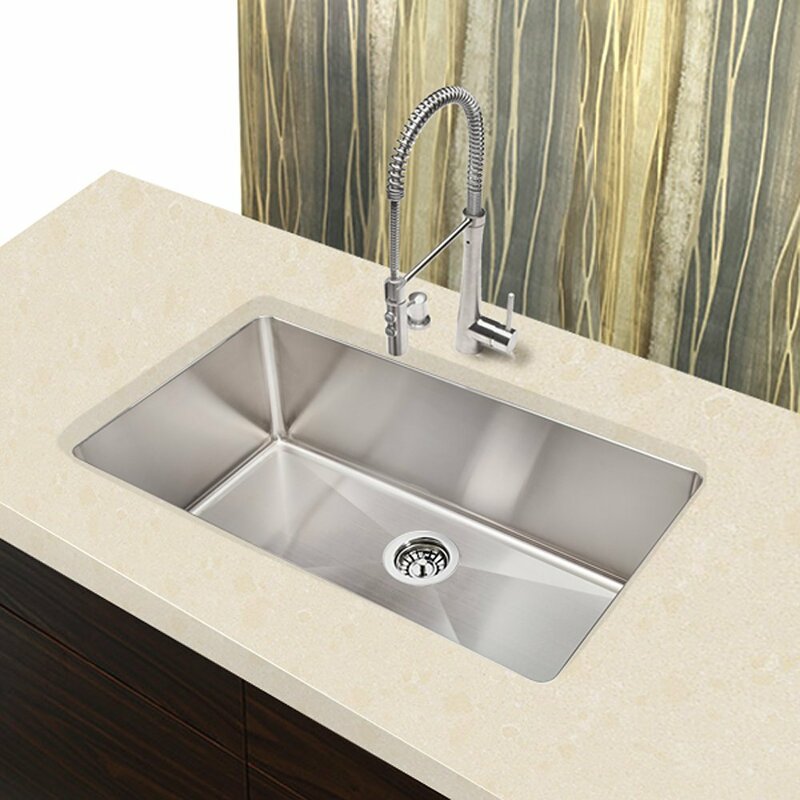 The sink actually includes more components and features than the expensive renowned brands available in the market and that too at three times less cost.